My cousin, Dawn*, and I were teenagers when we sat on her living room floor flipping through a photo album. On the first page my Aunt Deidre* was pictured with a big smile, holding a precious baby with an adorable beauty mark on her forehead. That day, Dawn shared with me that her mom had offered to give her birth mom’s information to her when she turned eighteen. My Aunt had told Dawn she could contact her if she wanted. 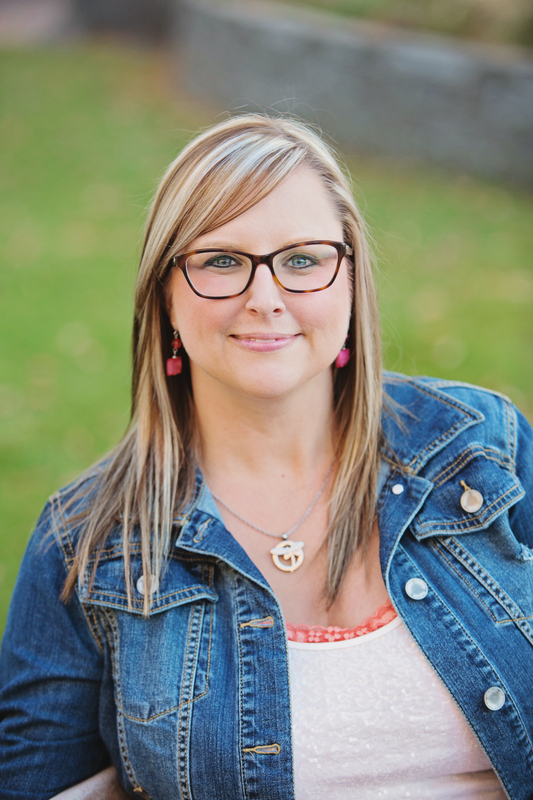 Dawn is now in her early thirties, and her love for her adoptive mom shines. She still has not searched out her birth mother, and doesn’t have the desire to. I share this because these aren’t the stories that are circulated, the ones we hear about are those who go searching for their birth parents because they feel a void in their life, they feel there are unanswered questions, they don’t feel their life is complete. It’s great to hear those stories, but we miss out on the ones where adoptees are content and don’t feel the need to have a close relationship with their birth mom. I came across another similar story last year. Justin and I shared our foster/adoption story at church for National Adoption Awareness Month and afterwards we welcomed any questions. I met Jessica* and later talked at length with her on the phone. She was adopted and is considering adopting. Jessica asked questions and told me about her search for her bio mom, only because she wanted medical information. After traveling across states, trying to get records which are sealed, and hiring lawyers, she has yet to get access to her birth family information. As we talked she came to a realization that hadn’t hit her until that moment on the phone, which was how much her adoptive mom went through emotionally. She said, “My mom is very sensitive, and I never realized until now how hard so much of this has been for her.” Jessica was referring to the beginning stages of her parents adopting her, to the pain her mother must have felt when Jessica expressed she want to look for her birth mother, even if the only reason was for medical purposes. She cried and she told me over and over how close her and her mother are, how much she loves her, and how much our conversation showed her the sacrifices her adoptive mother had made. It wasn’t my goal in the conversation at all, but it’s what she saw, and really seemed to be what she needed. Her love for her mom was enviable in a way, just as my cousins love for my Aunt Deidre. I think both of these stories show that not everyone has a deep desire to be connected to their birth mom. If someones does, it’s perfectly fine, but those are the majority of stories we hear. Jessica’s and Dawn’s aren’t talked about, and it seems it’s becoming taboo to do so. Their stories are beautiful to me because I see deep love and a bond that doesn’t need replaced nor added to. It’s enough for these two women. 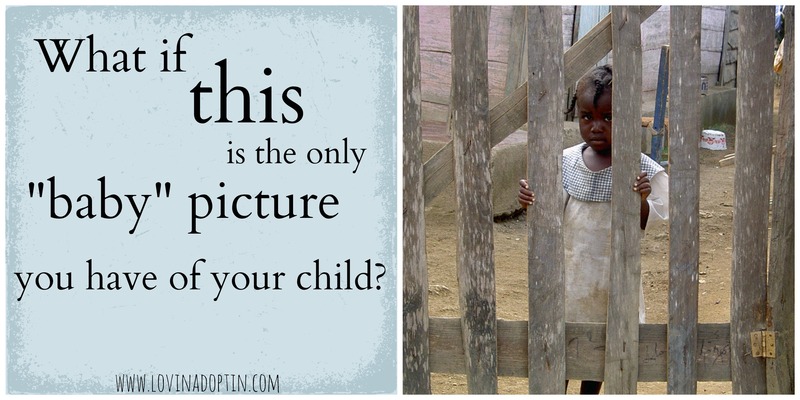 We don’t hear these stories in the adoption community. I struggled for months about writing on this topic. 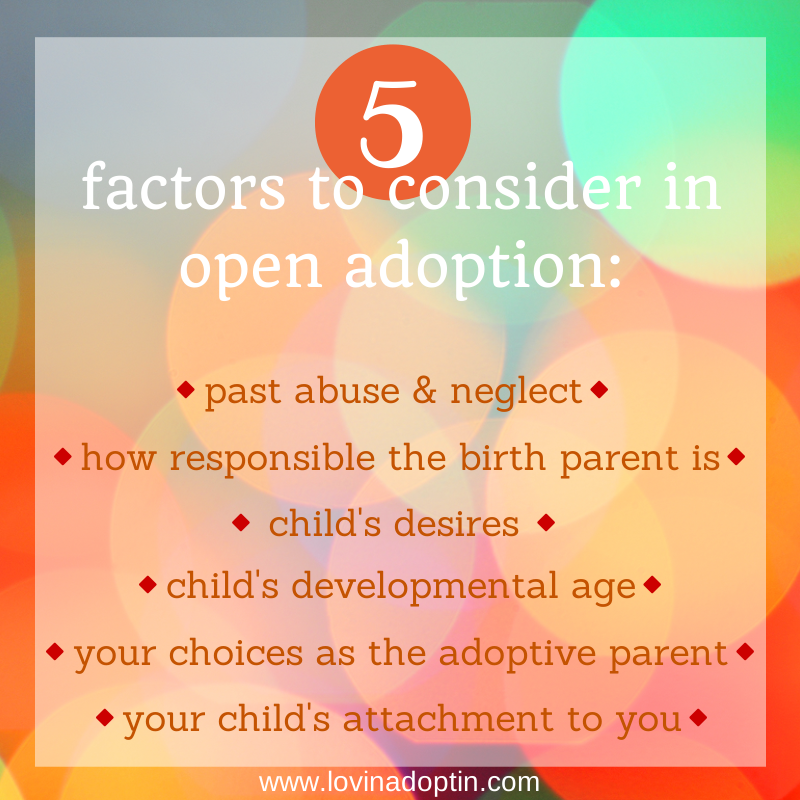 I’ve seen open adoptions worked out in many ways. Some are extremely involved, with the kids spending the night with birth parents, and birth parents visiting for holidays and weekends. Some families allow the kids to talk to their birth parents on the phone, some meet at parks. 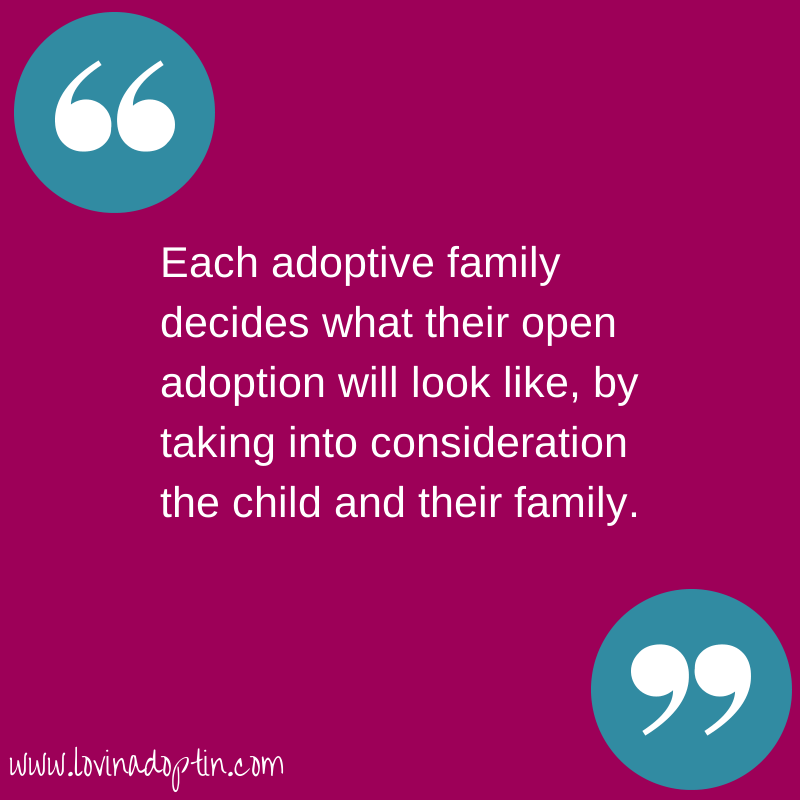 When considering what an open or semi-open adoption will look like, consideration must be made for how the child came to adoption, for it happens through many different avenues. Infants are adopted domestically, children are adopted from Russia where they may have been homeless for a time, starved, or abused. Foster children in the US have either been neglected, abandoned, or abused by their bio parents. Each situation need to be weighed individually to assess what involvement the child can handle with their biological parent. I’ve seen families involve bio parents in their lives with weekly phone calls and monthly visits with the parent who abused the child. I don’t think enough consideration is given to the child when involving bio parents in these situations. I believe so much more harm is done and healing is halted when a child is confused as to where their loyalty lies. Likewise, sometimes children and teens can’t figure out a relationship where their bio parent abused them and yet they’re in constant contact with that parent. Parents will complain about their child’s behaviors, wetting the bed, sneaking food, aggressive behaviors at school, manipulation, and yet they don’t look at the relationship the child has with their birth parent. These behaviors can definitely exist in hurting kids who don’t have a birth parents constant presence, but if adoptive parents don’t give the child time to heal and put the child first, they are fighting an uphill battle. So much emphasis has been placed on the birth parents today that I feel strongly that children’s needs and desires aren’t being met. We have a semi-open adoption with our daughter, Payton’s, bio mom and Aunt, and I’m glad for the way we’ve handled it. If it would’ve been done differently, Payton would’ve been damaged even more emotionally, and she already had a hard enough time as it was. Next week I will share what our semi-open adoption looks like. 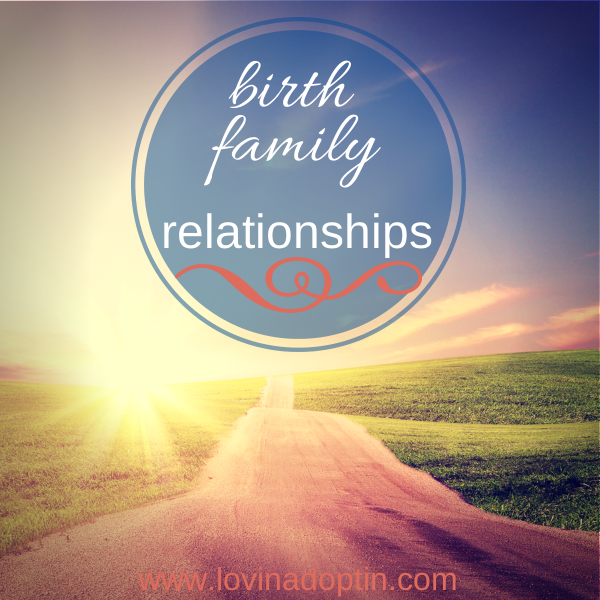 Each family involvement with birth families will look different, and in all cases, there needs to be balance. Involvement with birth families will also look different depending on your child’s chronological and developmental age. 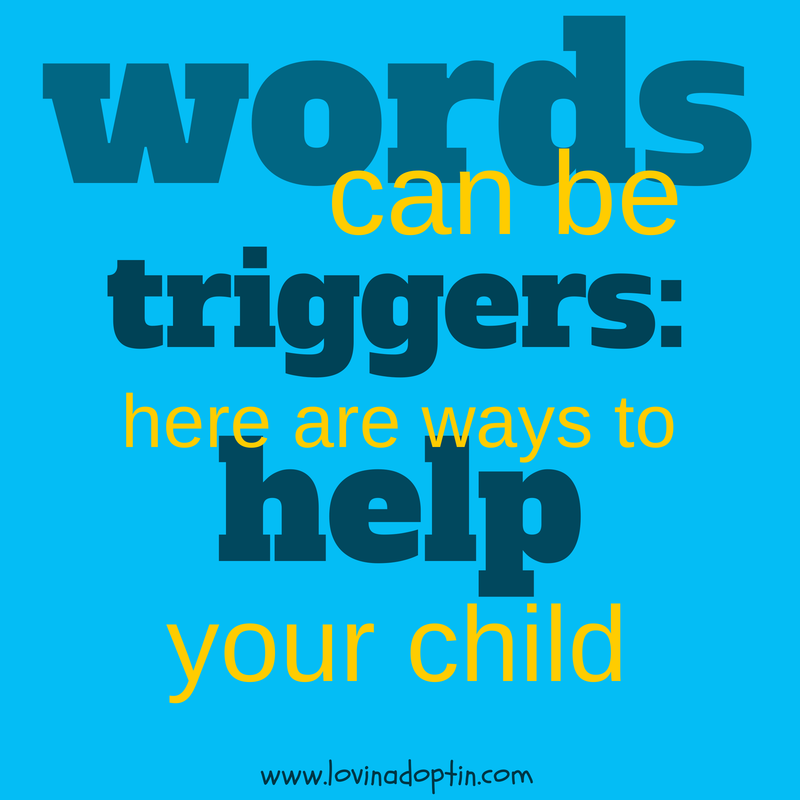 What is your child saying to you (verbally and through actions) they want? Ah yes, the dreaded baby photo assignment. This is the earliest picture I have of DD (adopted daughter). Most of her baby teeth were rotten. Her hair was wispy like a person who is undergoing cancer treatment. She is dressed in multiple layers of clothing because she had no body fat to keep her warm. She was Negative 15 percent for weight and Negative 5 percent for height. Somehow, I don’t think she would want to share this picture with peers despite that beautiful sparkle in her eyes. She is 5 years old. We parents of children adopted older are all to aware of this assignment and related ones (family tree). We call it the “dreaded assignment”. In these links above there are suggestions to use instead of “baby pictures”. But there will be no picture from DD for this 8th grade yearbook nor for younger brother’s next year. I will share this information with the folks who handle the yearbook. I believe that this is the first year they have done this in a long time. Perhaps we now know why. I don’t believe we should blame teachers or schools for doing these projects, after all the majority of society isn’t adopted. However, I do believe teachers need to be aware of the students in their classrooms and make alternatives for these assignments so all children can participate without being reminded that they have a different beginning. Having open communication with teachers is essential in helping them understand your perspective, and remember they may not be familiar with adoption and this is why these assignments and projects don’t take adoption or foster care into consideration. In the case of a family tree, parents have chosen to include both the adoptive family and the birth family. You can see examples of this in the links below. I have considered what I will do if my children are asked to create a family tree. (Please note, this is only my opinion for my family and our experience.) My children will create a family tree with our family being their “tree.” We come to this with a different perspective, we adopted from foster care, we haven’t been in close contact with our children’s biological family, so this works for us. We aren’t lying to our children, but we are their tree. It’s not a “blood related” tree, but it’s their tree. 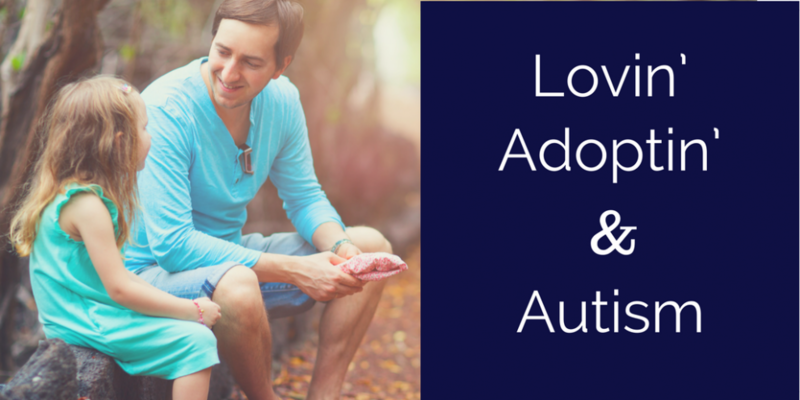 Have you experienced these assignments with your foster or adopted children? How did you handle it? I’m sure others would love to get ideas, so please share. If you have a friend or family member who is fostering or has adopted, please feel free to share. You can receive updates by subscribing in the upper right side of this website. Also, you can follow me on Twitter and Facebook to get more links to helpful information. It’s difficult to see through the anger, the hate, the attitudes. If our children have created coping mechanisms, it can be almost impossible to see through the smiles, the laughing, and the efforts they make to see us happy. What can’t we see through all of this? 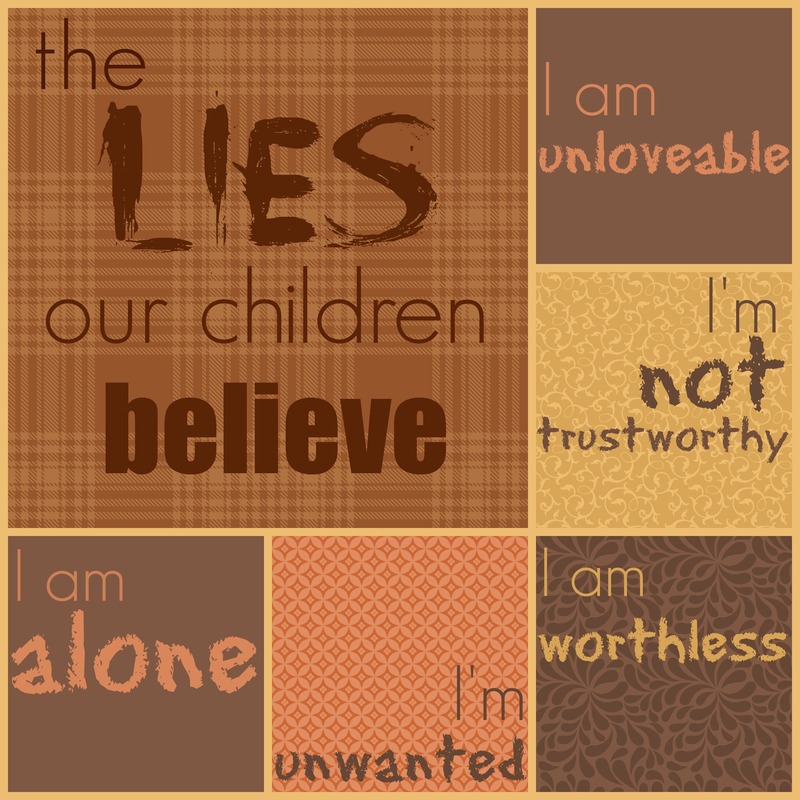 The lies our children believe; lies about themselves, the world, and others. The experiences our children had before they came to us taught them that they are unloveable, unworthy, that they can’t do anything right. They learned that the world is a scary place, that they’d have to protect themselves because no one else would. They learned that adults aren’t trustworthy. This makes it difficult when they come into our home because these lies that are circulating in their head don’t go away. There are no magic words to fix what they believe. (You can see here what I wrote about how we consistently tell our children truths: you’re beautiful, you’re smart, I love you, but it’s our actions that will make the most difference in the end.) Eventually our kids will see that we care about them and we’re dedicated to them, but it’s not a quick and easy fix. Why? Because these core beliefs have become a foundation for them. I was talking with a friend yesterday who has cared for some hurting teens. She said that every time she told one of the girls, “I love you,” the girl would become very angry. The girl became angry because she hadn’t been loved by anyone. Sometimes parents think that if they just show the child love (as in affection and caring for them) the child will accept what the parent gives, and that doesn’t happen with many hurting kids. Even those of us who haven’t experienced neglect, abuse, and trauma have lies we believe about ourselves, the world, and others. Can you imagine (or maybe you’ve experienced it yourself) if your foundational views of love and acceptance were rocked and broken at the core? How long would it take for someones love to change how you feel about yourself? Would it be easy to transform those thoughts? What lies do your children believe about themselves? How can you help them see the truth of who they are?